Whilst I’ve been out and about on library visits recently, people have been keen to hear about our new Minister, Rob Wilson, and about progress with publishing our Libraries Deliver: Ambition for Public Libraries in England 2016-2021 document. Notwithstanding parliamentary recess, our new Libraries Minister has been very engaged in his new portfolio. As well as numerous briefings and meetings with the DCMS Libraries Team and Libraries Taskforce Team, he’s started to meet Taskforce member organisations and visited a number of libraries. You may have seen the tweets from his trip on 23 August to Wokingham, Bicester, Farnham Common and Slough Libraries. The last stop was particularly impressive as the library was still being fitted out prior to its formal opening so we got a sneak preview. I’d recommend a visit: the huge range of books were still going in when we visited, but I particularly liked the dinosaur chairs in the children’s library and the reflections in the curved wall over the little garden are lovely (my engineering background coming out here)! Through these discussions and visits, the Minister has very quickly got to grips with the issues affecting the sector and the options available to library authorities for addressing them. 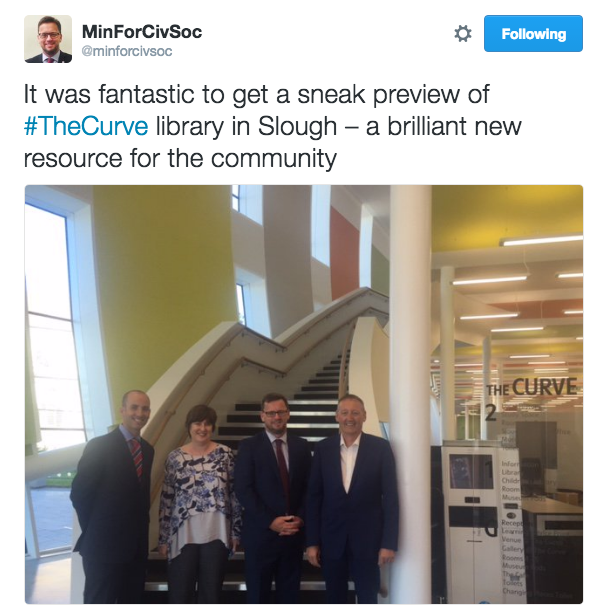 As I said in my previous blog, he wants to ensure libraries have a long-term sustainable future, and is clearly going to be pressing authorities to ensure they have considered all options for service delivery before making significant changes to their service. This echoes the views of the Taskforce - and the feedback from the Ambition consultation - that library authorities need to take a strategic, long-term approach to planning and transforming their library service, in consultation with their communities, rather than making arbitrary ad-hoc cuts. We understand and accept that authorities are having to make difficult decisions in light of their limited budgets but, if short-term savings really are required, it needs to be clear how the proposals developed sit alongside - and in the context of - the overall strategic direction of travel and a future-facing vision. They should not prejudice longer-term ambitions. As has been said to me many times, once a library has been closed, it’s very difficult to re-open it again! Ultimately, we want to ensure that sustainable plans are put in place for the longer-term for all library services, to stop the need for ad-hoc cuts in future years. It is vital that the local community is fully involved in those discussions and able to express what they need from, and be part of the development of, their local library services in the future. The Taskforce role is to support this local activity by providing a strategic vision at the national level (in the form of our upcoming Libraries Deliver: Ambition document), as well as continuing to share advice and guidance and good practice examples from places that have done this well. For now, this information is captured in our Libraries Shaping the Future Toolkit, but there’ll be more on how we want to build on this when Libraries Deliver: Ambition is published in the next few months.